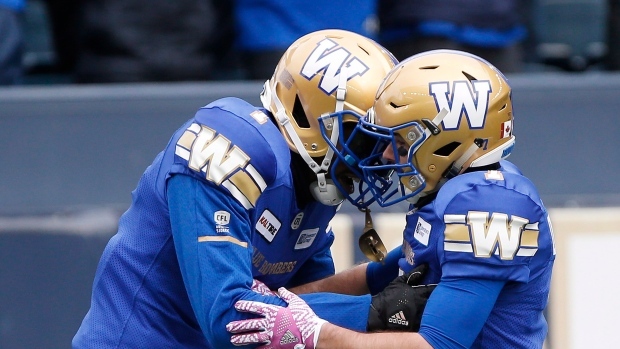 WINNIPEG — Adam Bighill was signed by the Blue Bombers for his leadership and tenacious talents. He delivered big time on Saturday. "When you get a quarterback sack it feels good," said Bighill, a seven-year veteran who was the CFL's top defensive player in 2015 while with the B.C. Lions. "You're really taking the wind right out of them and it's demoralizing for them, and it's demoralizing for your opponent when you're just beating your man one-on-one and you're winning." "It's just a taste of reality. It happens," said Saskatchewan defensive lineman Charleston Hughes, who had two tackles, including one for a loss. "We did get shut out. They pretty much dominated the whole entire game. Now you just really go back to the drawing board and figure out what happens." "We've got to protect (Collaros)," Riders offensive lineman Brendon LaBatte said. "You can't let him get roughed up, especially early in the game. "And we can't turn the ball over because I think no matter what else we focus on, that was the one thing that truly put the dagger in us." Loffler's second interception of the game — his third pick of the season — led to Justin Medlock's 29-yarder at 6:11 of the second quarter. Medlock was also good on four converts. "I've been a part of games where our defence played good enough for a shutout, but maybe there was a single scored at some point," Nichols said. "To have no points scored is an unbelievable effort by our defence. They've been playing unbelievable football and I would like to think we prepare them well all week at practice." Saskatchewan head coach Chris Jones called it an "inexplicable loss" with too many early mistakes. He was asked if he was worried about Collaros's recent performances. "My name's not Chicken Little so I'm not going to sit here and start pointing fingers at anybody," Jones said. "I mean, if I'm pointing fingers at anybody, it needs to be me."